A comprehensive look at the eagerly anticipated New Acropolis Museum in Athens, Greece, and the celebrated collection it houses. 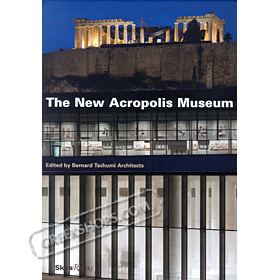 Marking the opening of the New Acropolis Museum, this book examines both its architecture and the archaeological treasures it was built to house. The building addresses the dramatic complexities of the collection and the site with minimalist simplicity by using three main materials—glass, stainless steel, and concrete. "There’s no way at the beginning of the twenty-first century you can try to imitate even superficially the art of 2,500 years ago," Tschumi says. The "precision of the concept was really what counted." The book provides an in-depth look at the creation of the building, set only 280 meters from the Parthenon, as well as the restoration, preservation, and housing of its exhibits through over 200 photographs, drawings, and texts.